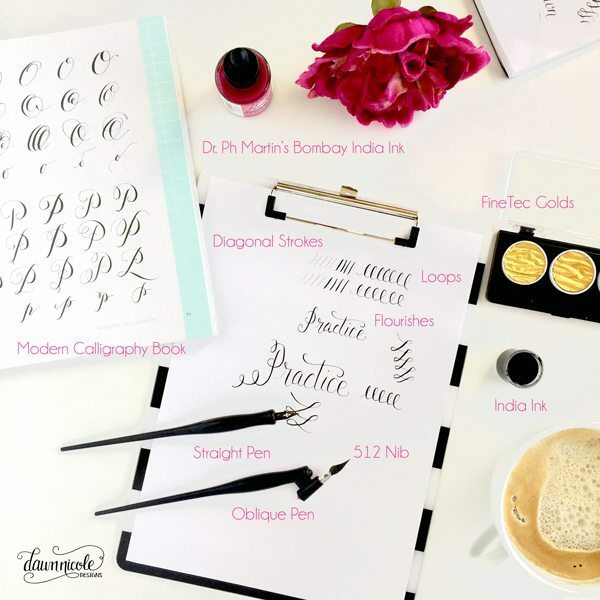 Modern Calligraphy 101: The Basic Supplies you’ll need to get started with practicing + free practice sheets! When I shared this video of me playing with some gold calligraphy the other day, the questions I received made me think I should do a post on the basics of getting started with Modern Calligraphy. The main reason I wanted to share the basics with you is because I really believe anyone can learn this art form if they want to! It was so hard at first, I almost gave up. I’m a lefty and though I am a hand-lettering artist, I never had much luck with getting calligraphy with a traditional pen to look like anything more than chicken scratch. And then I learned brush lettering. Practicing that started to make using pressure to control my stroke become second nature. So I decided to give Modern Calligraphy another shot and it just clicked. 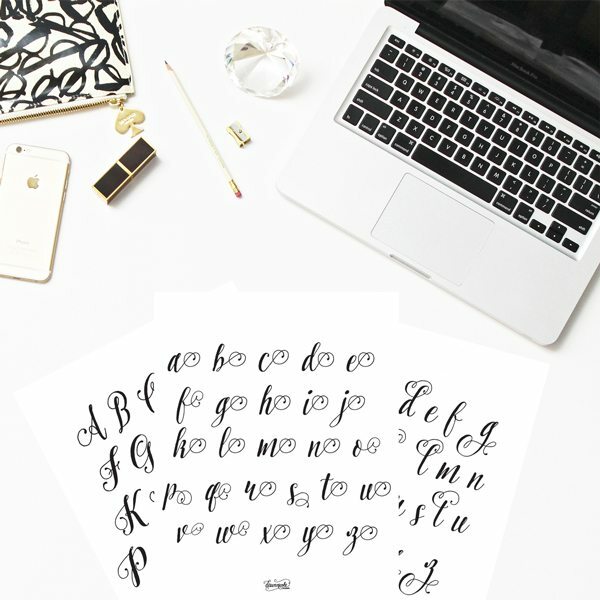 I still practice a ton and I also still consider myself a beginner in learning this lovely art form, so this post will cover the very basis: supplies, basic strokes, and practice worksheets for letters with flourishes. Let’s get started with what you’ll need to learn and practice. You don’t need the fanciest stuff to begin. These are fairly inexpensive but not so cheap that they don’t work. I’m a bigger believer in the value of purchasing quality art supplies! 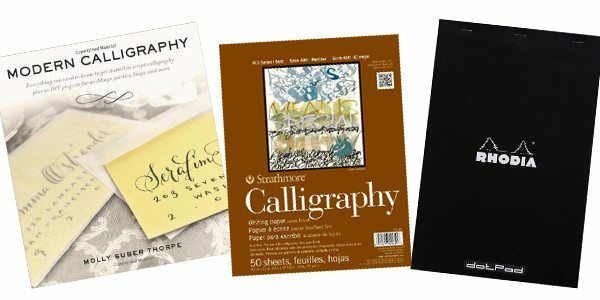 Modern Calligraphy by Molly Suber Thorpe – When I decided I wanted to learn Modern Calligraphy I bought this book. It’s wonderfully informative, has beautiful letter sample pages, and even has a ton of project ideas to make with your calligraphy. Strathmore Calligraphy Pad – This pad is designed to work well with calligraphy pens inks. Rhodia Dot Pad – You see me use this pad a lot in the videos I do. The little dots are perfect for keeping your lettering straight at the baseline yet slanted italic style. Calligraphy Straight Pen and Nib Set – This is the set I started out with. My favorite nib in the set is the pointed 512. I find it easiest to work with as a beginner. Oblique Pen Holder – They say the straight pen holder is better for lefties but I actually find the oblique much easier to work with. India Ink – There are so many lovely inks you can use for calligraphy but this basic one is perfect for getting started. 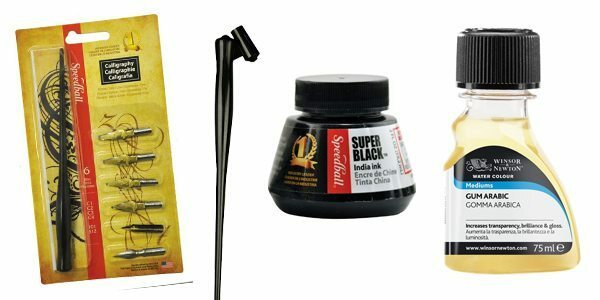 Liquid Gum Arabic – This helps prep your nibs so the ink coats them properly. I didn’t have it to start but invested in it recently and oh what a difference it makes! Pen Cleaner – Pretty self-explanatory. This is for cleaning your nibs. 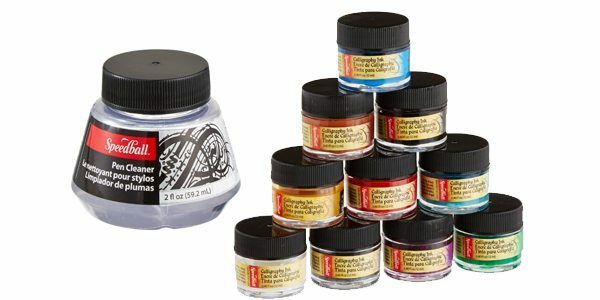 Ink Set – For playing with colored inks. Just plain fun! New nibs are coated to keep them from rusting. Prep a new nib by running it through the flame of a candle very briefly or scrubbing it with a toothpaste and toothbrush. Rinse and dry it. Your ink should coat the nib smoothly if the nib is properly prepped. If it beads try running it through the flame of a candle very briefly or scrubbing it with a toothpaste and toothbrush once more. Loops: Practice using various pressure in a continuous motion to achieve loops as shown below. Simple Flourishes: Again practice using various pressure in a continuous motion to achieve loops as shown below. Then practice letters! I put together 9 sheets you can use to practice letters with flourishes. Don’t worry if your letters don’t match up perfectly. All that matters to start is getting in practice, getting used to using pressure to control your stroke with, and practicing as often as you can. You’ll be amazed at how quickly you improve just by doing it! Download the free Modern Calligraphy practice sheets here. Once letters get easier, then move on to words and sentences. Check out all my tips on Hand Lettering including basics, brush lettering, cheater calligraphy, book recommendations and more here. Another awesome resource, Dawn! I really appreciate all the work you put into these posts. You have helped me become a more confident letterer! After discovering Lindsey Bugbee (of The Postman’s Knock) last summer, I purchased some basic pointed pen supplies and started trying to learn calligraphy. I am with you though – it just never “clicked.” I kept at it for a while, but then lost interest. Then, when Lindsey did a post this past summer about using Tombows, I just KNEW that’s what I should be using. Brush lettering has been so much easier for me to practice and get better at, and now I find myself wanting to attempt the pointed pen again! It’s funny how things come back around! I too am a lefty just getting started in calligraphy. I’ve played around with straight and oblique pens, but can’t seem to keep the nibs from scratching and getting poor results. (The angle is all wrong LOL.) I just purchased a set of lefty nibs but haven’t had the chance to try them yet. I am looking forward to trying some of your tips to get better results (flame the nibs & using liquid gum Arabic). I just picked up a copy of “Left-Handed Calligraphy” and it’s less than desirable. I was interested in what approach you took taking those ‘right-handed’ resource materials and what success you’ve learned (not in the book)? Any other good tips/tricks for us leftys? Awesome post! I’d like to use this as a guideline to my calligraphy practice. Is it ok with you if I upload my practices and progress online? Will definitly give you credits for the worksheet. Thank you for the practice sheets! have been trying to perfect my skill level and found these most useful! Hi Raeesah! You’re so very welcome. I’m so happy you found them helpful! Happy practicing! Hello! Can I use printer ink? Because indian ink is little bit expensive and hard to find in my city.. I think I can use printer ink? I wouldn’t use printer ink for calligraphy but any kind of black ink that’s meant for calligraphy will be fine to use! WalMart carries a very economical black ink that works good for starting out. I’m sorry if this question has been asked to you before, but what do you think is the best nib/pen holder for a lefty? I’ve started with a regular straight nib holder but I’m having trouble using it for flourishes. Any advice would be great!!! Hi Claudia! I used a straight one first. Oblique holders are actually meant for righties but I love them and had good luck with them. I recommend trying both to see what works best for you (I started with the inexpensive Speedball versions of both). I alternate between both styles of holders still! Great! I really appreciate you taking the time to respond. Thanks again and happy lettering! First and foremost thank you so much for all your instructive help with lettering. I have decided to start trying straight pen calligraphy and love your practice sheets. I do have one problem though I find that my pen runs out of ink quickly and am trying to figure out what I am doing wrong. Do you know why this would happen and what the solution would be ? I have all the good supplies (Nikko nibs, speedball inks, Rhodia pads) and I STILL can’t get the nibs to stop catching and skipping, mainly upstroking. After practicing daily and making a HUGE mess, I bought some Tombows and am IN LOVE with lettering. I’ve been at it daily for almost a year and am starting to have people ask me to make things for them. I dragged out my nibs again the other day to have a go at it, and decided that dip pens are just not for me. My penmanship is just so much more fluid and I am able to vary my style so much more with brush pens. My question though…if someone asked me to calligraph wedding envelopes, is it considered cheating if I use a Tombow Fude?? Does calligraphy HAVE to be done with a dip pen to be considered “real calligraphy”? Thanks for all of your inspiration and hard work to keep us going! Oh whew, thanks for that! I was really feeling bad that I would be insulting the talented dip pen artists. I have much respect for them, and for the art itself. Hi Janice! This is how I do it: 1️⃣ Upload the PDF to Dropbox (or email it to yourself). 2️⃣ Open it on your iPad. 3️⃣ Take a screenshot of the page you want to practice. 4️⃣ Open in Procreate and practice the worksheet (on a new layer)!